Senator Bernie Sanders wants to slap a special tax on Amazon and other big companies that employ workers who collect food stamps and other public assistance. But Amazon disputes Sanders' depiction, saying its pay and benefits are competitive with other retailers. The progressive icon from Vermont has been on the attack lately, posting a series of Facebook videos over the past week calling out Amazon (AMZN) and Walmart (WMT) for not paying a living wage, which he lists in some posts as $15 an hour. In one video, titled "Get Amazon Off of Corporate Welfare," he highlighted that CEO Jeff Bezos is the world's richest person and earns $260 million a day, while many of his workers are on food stamps. "Mr. Bezos continues to pay many thousands of his Amazon employees wages that are so low that they are forced to depend on taxpayer-funded programs, such as food stamps, Medicaid and subsidized housing in order to survive," Sanders said in the video, stressing that taxpayers foot the bill for these benefits. "Frankly, I don't believe that ordinary Americans should be subsidizing the wealthiest people in the world because they pay their employees inadequate wages." The senator argues that Amazon's median employee pay is $28,446, which he says is 9% less than the industry average and "well below what constitutes a living wage in the United States." Also, he says he believes that many of the company's workers are either contractors or employed by temporary staffing agencies and earn even less. Bottom line: No one working for the wealthiest person on Earth should have to rely on food stamps. No one working for a man who earns $260 million a day should be forced to sleep in their car. Yet that is what's happening at Amazon. Sanders plans to introduce legislation next week that would levy a tax on large companies equal to the value of the government benefits their workers receive. He argues that if employers paid a living wage, taxpayers would save $150 billion a year on public assistance programs. In addition, he posted a form on his Senate and Facebook pages urging Amazon employees to share their experiences working at the online retail titan and asking them whether they are on public assistance or struggle with demanding working conditions. Amazon, however, called Sanders' assertions "inaccurate and misleading" in a blog post Wednesday. The company says that Sanders' data for food stamp recipients includes people who only worked at Amazon for a short period of time or who chose to work part-time. The median U.S. salary for full-time Amazon employees is $34,123, it says. Sanders' figure includes part-time employees and those who work globally. Related: Bernie Sanders is hosting a town hall for workers. Their CEOs are invited. "We encourage anyone to compare our pay and benefits to other retailers," it wrote, encouraging workers to fill out Sanders' form. 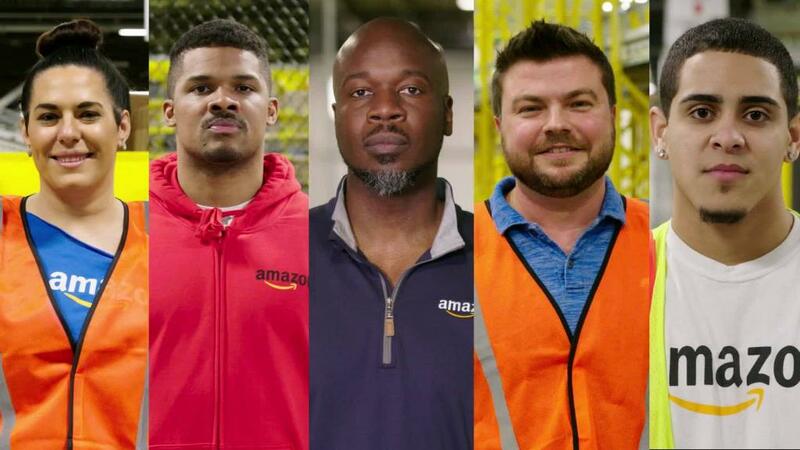 Updated: This article has been updated with information from Amazon regarding the median US salary for it full-time employees.